Ex-ex-gay people are those who formerly participated in the ex-gay movement in an attempt to change their sexual orientation to heterosexual, but who then later went on to publicly state they had a non-heterosexual sexual orientation. Organizations in the ex-gay movement such as Exodus International offer conversion therapy, with the claim that an LGBT person's involvement in the programming can change their sexual orientation to heterosexual. This type of programming is opposed by major medical organizations in the USA, including The National Association of Social Workers, The American Psychological Association, The American Psychiatric Association, The American Counseling Association, and The American Academy of Pediatrics. The American Psychiatric Association describes conversion therapy as ineffective at changing sexual orientation, and as harmful to the LGBT person's well-being. It is also opposed by the United Kingdom Council for Psychotherapy, who issued a joint leaflet with the British Psychoanalytic Council, the Royal College of Psychiatrists, the British Association for Counselling and Psychotherapy, the British Psychological Society, Pink Therapy, The National Counselling Society and LGB rights group Stonewall against such practices. Three publicly ex-ex-gay people are Günter Baum, Peterson Toscano and Christine Bakke. In April 2007, Toscano and Bakke founded Beyond Ex-Gay, an on-line resource for ex-ex gays. In June 2007, together with Soulforce and the LGBT Resource Center at University of California, Irvine organized the first ever Ex-Gay Survivor Conference. In 1979, Exodus International's co-founder Michael Bussee and his partner Gary Cooper quit the group and held a life commitment ceremony together. On June 27, 2007, Bussee, along with fellow former Exodus leaders Jeremy Marks and Darlene Bogle, issued a public apology for their roles in Exodus. Exodus disbanded as an organization on June 20, 2013. Michael Bussee and Gary Cooper, co-founders of Exodus International, left the organization and in 1979, held a life commitment ceremony. Bussee went on to become an outspoken critic of Exodus and the ex-gay movement. In June 2007, Bussee issued an apology for his part in the ex-gay movement. Ben Gresham is an Australian man who went through three years of ex-gay therapy starting at sixteen years of age. He does media appearances, including ABC TV's The Hack Half Hour, SX News and Triple J (radio) regarding what he sees as the dangers of ex-gay programs and the psychological harm associated with them. Along with this, Gresham is a part of "Freedom 2 b[e]", which offers support to LGBT people from church backgrounds. Noe Gutierrez appeared in Warren Throckmorton's ex-gay video I Do Exist in 2004. This garnered some notice, as Gutierrez had previously appeared in a video for gay youth known as It's Elementary. Gutierrez later left the ex-gay movement and wrote about his experience. John Paulk, founder of Focus on the Family's ex-gay ministry Love Won Out and former chairman of Exodus International North America, renounced his claim to ex-gay status, denied that sexual orientation change is effective, and apologized for the harm he had caused in a formal apology in 2013. John Smid is the former director of the Memphis, Tennessee ex-gay ministry Love In Action, a position in which he was a leading spokesman for converting homosexuals into heterosexuals. In 2011, years after having left his Love In Action post, he stated that he was homosexual, and that he had "never met a man who experienced a change from homosexual to heterosexual." Peterson Toscano is an actor who was involved in the ex-gay movement for 17 years. He performs a related one-man satire titled Doin' Time in the Homo No Mo Halfway House, and with Christine Bakke runs Beyond Ex-Gay, a support website for people coming out of ex-gay experiences. Anthony Venn-Brown is a former Australian evangelist in the Assemblies of God and an author whose book, A Life of Unlearning, describes his experience in Australia's first ex-gay program. Venn-Brown co-founded "Freedom 2b" which offers support to LGBT people from church backgrounds and who have been displaced from the ex-gay movement. In 2007 he co-ordinated the release of a statement from five Australian ex-gay leaders who publicly apologized for their past actions. Anthony Venn-Brown has been a leader in monitoring ex-gay activities in Australia, New Zealand and Asia and countering the "ex-gay myth". ↑ "Journal; Lott's Lesbian Ally Frank Rich". The New York Times. July 22, 1998. Retrieved 2013-10-17. ↑ Gale Holland (1998-08-19). "Seeking the Heterosexual Within - Page 2 - News - Los Angeles". LA Weekly. Retrieved 2013-10-17. ↑ "Ex-Ex-Gay Reparations - Seattle Pullout - The Queer Issue - The Stranger, Seattle's Only Newspaper". Thestranger.com. 2006-06-22. Retrieved 2013-10-17. ↑ "Just the Facts about Sexual Orientation & Youth: A Primer for Principals, Educators & School Personnel". Apa.org. 2007-02-23. Retrieved 2013-10-17. ↑ "Sexuality". Apa.org. Retrieved 2013-10-17. ↑ "Conversion therapy: Consensus statement" (PDF). healthylives.stonewall.org.uk. The United Kingdom Council for Psychotherapy. Retrieved 5 January 2015. ↑ "Reparative Therapy". healthylives.stonewall.org.uk. Stonewall. Retrieved 5 January 2015. 1 2 Their story is one of the foci of the documentary One Nation Under God (1993), directed by Teodoro Maniaci and Francine Rzeznik. ↑ "Apology from Former Ex-Gay Leaders". June 27, 2007. Archived from the original on December 20, 2007. Retrieved January 6, 2009. As former leaders of ex-gay ministries, we apologize to those individuals and families who believed our message that there is something inherently wrong with being gay, lesbian, bisexual, or transgender. Some who heard our message were compelled to try to change an integral part of themselves, bringing harm to themselves and their families. Although we acted in good faith, we have since witnessed the isolation, shame, fear, and loss of faith that this message creates. We apologize for our part in the message of broken truth we spoke on behalf of Exodus and other organizations. We call on other former ex-gay leaders to join the healing and reconciliation process by adding their names to this apology. We encourage current leaders of ex-gay programs to have the courage to evaluate the fruit of their programs. We ask them to consider the long-term effects of their ministry. ↑ Bussee, Michael (June 27, 2007). "Apology from Former Ex-Gay Leaders". Archived from the original on December 12, 2007. Retrieved January 6, 2009. ↑ Gresham, Benjamin (October 31, 2010). "Christian, happy and gay. Yes, it's possible!". SX News. Evolution Publishing. Archived from the original on November 12, 2010. ↑ Gutierrez, Noe (2008-05-16). "Noe Gutierrez: What I Learned From Ex-Gay Ministry". Ex-Gay Watch. Retrieved 2013-10-17. ↑ Brydum, Sunnivie (2013-04-24). "John Paulk Formally Renounces, Apologizes for Harmful 'Ex-Gay' Movement". Advocate.com. Retrieved 2013-10-17. 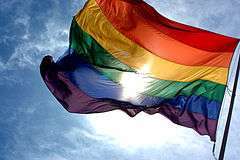 ↑ "Ministry seeks to lead away from gay life". Arizona Daily Star. 1997-11-08. Retrieved 2011-10-13. ↑ Wayne Besen (2011-10-12). "Former 'Ex-Gay' Activist Admits Gay People Don't Change". Falls Church News-Press. Retrieved 2011-10-13. ↑ "Anthony Venn-Brown: Book". Gayambassador1.blogspot.com.au. Retrieved 2013-10-17. ↑ "Gay, Lesbian, Bisexual, Trans & Intersex from Christian backgrounds". freedom2b. 2013-09-16. Retrieved 2013-10-17. ↑ "Ambassadors & Bridge Builders International: Five of Australia's Ex-gay Leaders Change Perspective – But why has it taken so long?". Gayambassador.blogspot.com.au. Retrieved 2013-10-17. ↑ Venn-Brown, Anthony (July 23, 2012). "Ex-gay Away". Gay News Network. Archived from the original on July 25, 2012. ↑ "Gay News". EDGE Boston. 2007-10-24. Retrieved 2013-10-17. J. G. Ford, "Reparative Therapy -- A Pseudoscience"